Hi everyone! Today I am pleased to have a guess post by Linda Weaver Clarke. 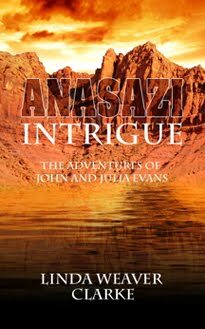 Not only has she written a special post for us, but she is offering a FREE copy of her latest novel:Anasazi Intrigue! This contest will end at 4pm New York time tomorrow (2/7/12). I have asked Linda one of the most asked questions of a writer...Why do you write? Simple! It all started when I began writing my own ancestor’s stories. Their experiences were so interesting to me and it was in a time period that I was intrigued by. I believe it’s very important to teach our children their heritage. We are the people we are because of our ancestors. Our traits, our genes, our beliefs, our courage, and our temperaments! Where did we get that red hair? Why am I so tall? Why is music part of my life? Did I inherit these traits from my grandparents? Each of us has a story from our ancestors or even our own story to tell. It’s up to us to write these experiences down. After writing about my ancestors, I couldn’t stop writing, so I turned to historical fiction. After writing five historical “sweet” romances, I turned to mystery/adventure for a difference. This mystery series was inspired by one of my favorite TV shows long ago called Hart to Hart, which featured a married couple investigating and solving crimes staring Robert Wagner and Stefanie Powers. The couple was madly in love–you laughed at the humor and sighed at the romance. I wanted to create something similar with a little suspense and adventure. In this series Julia is a reporter for a daily newspaper and John is a professional knife maker. Just like Hart to Hart, because of her curiosity, Julia gets herself into a bunch of trouble. Before long, she finds herself and her husband up to their necks in danger and running for their lives. There is one difference. John and Julia Evans have three college age daughters. I feel this makes the couple have more appeal to a larger audience. Some people wonder if I put real experiences in my novels. Was it hard to switch from historical romance to mystery? Oh my! Yes! The writing process between romance and mystery is quite a change with a completely different mind set. With romance, you plan out the plot around the meeting of a couple. As you write, you develop some sort of charisma between the characters, making the reader feel excited that one day they're going to hit it off and fall in love. You, as the reader, know the outcome. But with a mystery, the reader is in the dark. The author has to come up with a plot that no one knows about until towards the end of the story and hope they haven’t figured it out. In a mystery, you may or may not allow your reader to know who the bad guys are, according to whether it’s just a mystery or mystery suspense. In a mystery, the reader doesn’t know who the bad guys are until the end of the book. With mystery suspense, the reader knows who they are and it makes for a more suspenseful outcome. Why am I having an ebook giveaway? Because I would like to introduce my books to new people. Whoever wins my ebook can spread the word to their friends and write reviews about it. So that’s why I’m having a giveaway. To win an ebook of Anasazi Intrigue, leave a comment on this blog and Sherry Gammon will pick a winner. Stolen artifacts, a devastating flood, a snoopy newspaper reporter, and mysterious events begin to unfold in this mystery adventure novel. When a devastating flood takes out several homes in a small town, Julia realizes the story and investigation are much bigger than she thought! Julia and her husband find themselves on the run trying to save their lives while finishing the story of a lifetime. She never realized that being a reporter could be so dangerous. Socrates Great Book Alert Award! Winners of the YA Blog hop! *SPOILER ALERT* Would Maggie have?